Manipulatives & small muscle | Play & development | KaBOOM! Manipulatives are physical play materials that children hold, stack, and sort such as blocks, plastic shapes, LEGOs, Lincoln logs, and more. When children manipulate these objects during play, they are not only having fun, they are also learning important math and critical thinking skills. 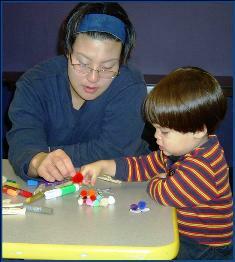 As they manipulate play objects, children begin to learn abstract concepts. A bridge is built from the concrete to the abstract. Children explore cause and effect, identify patterns, create logic maps, and match like objects. They begin to understand average as they play with varying objects heights, weights, depths, and lengths. Manipulatives are believed to be particularly important in developing early math and science skills. Children who might struggle to learn math in traditional classrooms sometimes find manipulative play helps aid their understanding. In an outdoor playspace, you can encourage manipulative play in sandboxes or with water tables. The manipulatives can be simple and inexpensive. Foam and cardboard blocks, different plastic shapes (stars, triangles), lots of different sizes and materials—these will all encourage children to build, sort, match, and manipulate!